Mr. Carnivore’s debut album Blue Light is an intimate and impassioned outpouring of raw music and emotion reflecting on uncomfortable topics with hauntingly beautiful vulnerability. 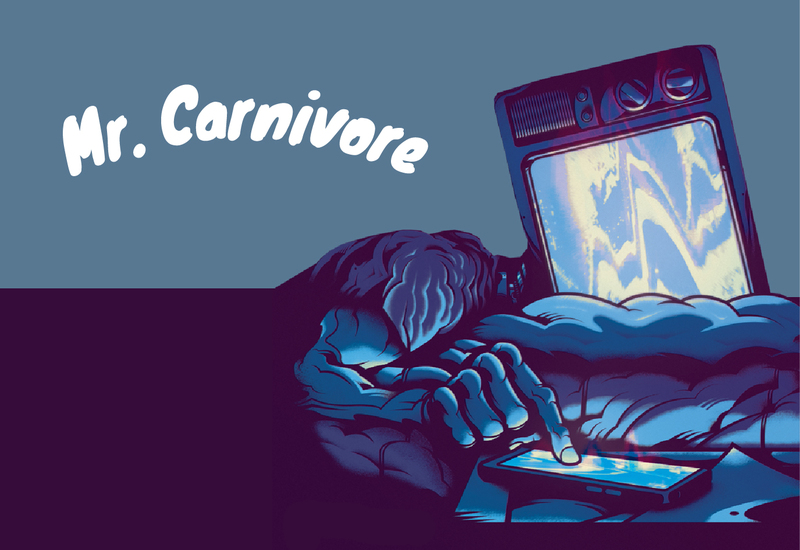 Cleveland indie rock band Mr. Carnivore charged into our lives in early 2018 with debut single “Knees,” a captivating reflection on the darker side of love that made them an early artist-to-watch and immediate favorite amongst this year’s newcomers. 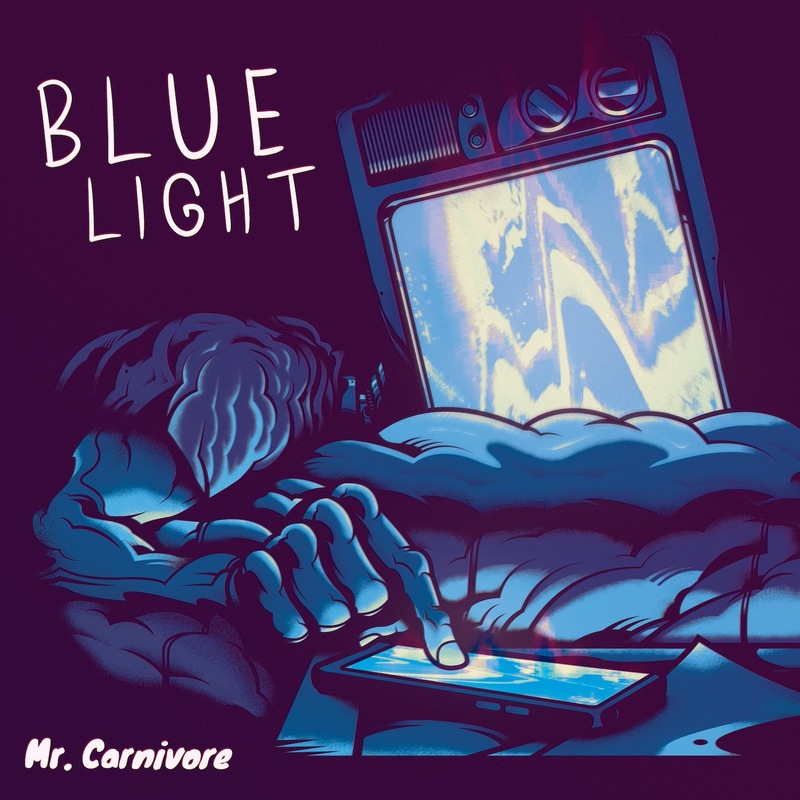 Nearly seven months later, Mr. Carnivore have proved they were worth both the hype and the wait: Their debut album Blue Light is an intimate and impassioned outpouring of raw music and emotion reflecting on uncomfortable topics with hauntingly beautiful vulnerability. Atwood Magazine is proud to be premiering Mr. Carnivore’s debut album Blue Light, independently out August 31, 2018. The indie rock band of brothers Pat LaGuardia (lead vocalist and guitar) and Joe LaGuardia (bass) strip down their instruments and expose their innermost selves on this intoxicating introduction, crafting a safe space full of introspective enlightenment and stimulating sensitivity. Blue Light is an open and honest snapshot of a human searching for fulfillment and reassessing his identity. Unabridged lyrics and catchy hooks help standout songs like “Cello,” “Paradise,” and “Wind Me Up” resonate, yet while these tracks may easily be repeated on their own, they are best appreciated within the context of Blue Light‘s spiritual and musical journey. Press play on this special debut album and put away your phone for half an hour; let yourself be consumed by Mr. Carnivore’s diary-like reflections and humbling contemplations. Join them on their escape from distraction and electronic deluge; dwell in sensitivity and embrace the real you. Experience this full record via our exclusive stream, and peek inside Blue Light with Atwood Magazine as Pat LaGuardia goes track-by-track through Mr. Carnivore’s debut album! Collecting voice messages has been a habit of mine since I got my first flip phone. I save all my old cellphones just for the voicemails. When you go back and listen to all of them it’s like listening to memories. It’s a cool little snapshot of time. I have always had a habit of saving voicemails from people that mean something to me, and when people in those voicemails cease to be part of your life it makes them more important. I went through all of my phones from high school on and pulled out the most important. All these voicemails pertain to people and things that went on in my life for the past 4 or 5 years that kind of get wrapped into the concept of the album. It fit the theme of electronics in general. This song is chalk full of irony, of which there is a lot of on this album. Essentially, the concept is about my realization that what most of society considers to be the “Upper Half” of living and what I consider to be the “Upper Half” of living are not the same thing. Well this is the one of those uncomfortably blunt songs for me. The lyrics for this song pretty much say exactly what happened. I was saving a hot air balloon ride as a possible way to propose to a girl that went on a first date up in an air balloon pretty quickly after we broke up. This song is a typical angst rebel song about simply not finding value in things that other people do. This was the first song I wrote coming out of my electronic screen coma, and it’s essentially about starting to feel human and passionate about life and music again. Atwood Magazine: For me, “Cello” captures the Mr. Carnivore sound best. What's song on the record do you feel very exemplifies your music? Much of this record feels like reflections from the mind of a musician, trying to make it big and maintain relationships at the same time. What themes, musically and emotionally,do you feel connects these songs? Mr. Carnivore: I think reflections is a great word in your statement there.. the process of writing the songs on this album was definitely a reflective period of time where I looked at the last 4 or 5 years and tried to sort out some of the things I grew through. I think emotionally the songs all share an ironic or rose colored glasses type of approach to topics are uncomfortable to talk about sometimes. Which was the hardest song to write on the record? “Hot Air Balloon” strikes me as one that must have been particularly difficult. Mr. Carnivore: It’s funny you say that because “Hot Air Balloon” was probably the easiest to write, but the hardest to perform. I don’t keep journals or anything like that, but sometimes I write my thoughts out on paper when I’m stressed or something gets stuck in my head. Most of that song was written out with no music or song in mind the words just kind of came out during a stress writting session. I just had to make them rhyme.